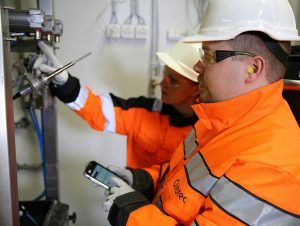 FINLAND – Customers can now get immediate feedback from their equipment inspections thanks to a new mobile app being rolled out for Outotec equipment. The app guides service technicians through the inspection process, allowing them to capture all relevant technical data and images to support improved decision making. As soon as the inspection is complete, the technician can email a preliminary report to the customer straight from the app. Outotec’s new app for smartphones and tablets generates immediate feedback from equipment inspections. Regular, systematic inspections provide operators with a clear understanding of the current condition and maintenance needs of the equipment, including future spare parts requirements. Outotec’s new mobile app for smartphones and tablets makes the inspection process faster and easier, meaning the information is available more quickly. The preliminary report is easy to share with colleagues, and it is followed up by a full report after Outotec experts have performed in-depth analysis of the data gathered during the inspection. The inspection app is currently available for selected technologies, but will be expanded to include all Outotec technologies in the near future. Find out how you can keep your operation running like clockwork with the Outotec Equipment Inspection service.